Charging documents filed in court Wednesday morning said Kokesh was charged with possession of hallucinogenic mushrooms, a Schedule I narcotic, while possessing a firearm. Possession of Schedule I or II drugs is a felony in Virginia, punishable by up to 10 years in prison and a maximum $2,500 fine. If convicted of possession of the drugs while also in possession of a firearm, Kokesh would face an additional minimum of two years in prison. Police retaliated last night against Adam Kokesh for releasing a video showing him load a shotgun in DC by breaking his door down, throwing a flash-bang into his home, kicking him on the ground, tearing apart his house, confiscating all cell phones in the home, breaking into his safe and taking everything from within, then finally arresting him and hauling him off to a police detention center. (HERNDON, VA 10 JULY 2013)� On the evening of Tuesday, 09JUL13, at approximately 7:45 PM, a combination of US Parks Police (an arm of the DHS) raided Adam Kokesh�s residence. Local Herndon police assisted in the armed invasion. 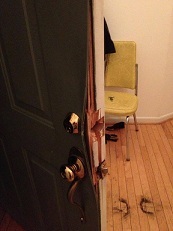 The officers used a battering ram to knock in the door after two knocks, and did not announce that they had a warrant. Immediately after breaking down the door, a flash bang grenade was deployed in the foyer. Numerous police vehicles, including a light armored vehicle and two low-flying helicopters barricaded Adam�s street. More than 20 armored SWAT team members surrounded the house, as well as a number of detectives, and plainclothes officers. Assault rifles were aimed on all members of the team as they were handcuffed without being told why they were detained. Masked and armored police in full �Storm Trooper� gear flooded in and ransacked the residence. The team was cordoned in a front room, while Adam was pulled aside for questioning. The ADAM VS THE MAN Team will be continuing production on the podcast and the Youtube channel as long as Adam remains imprisoned for an act of civil disobedience. We will continue to spread the message of liberty, self ownership, and the non-aggression principle regardless of the government�s relentless attacks on our operation. We will continue to combat its desperate attempts to crush a worldwide, revolutionary shift in the people�s understanding of the state�s illegitimacy�after all, good ideas don�t require force. I was present for this raid and the police most certainly used excessive force... The members of his crew were bound WAY too tightly, and a medic had to be called. A police officer kicked Adam while he was handcuffed and sitting on the ground... People, it's time to wake up. The police aren't here to protect you, they're here to take your rights away. My proof? The laser sights trained on me this afternoon- and the bruises on my wrists from the cuffs. HERNDON, Va. - FOX 5 has confirmed that U.S. Park Police along with Herndon Police are serving a search warrant at the home of Adam Kokesh, a pro-gun activist who was seen on a YouTube video posted on July 4th loading a shotgun in Freedom Plaza. Roads have been blocked off in the area of the 1500 block of Snow Flake Court in Herndon and residents have been told to stay indoors while police serve the warrant. 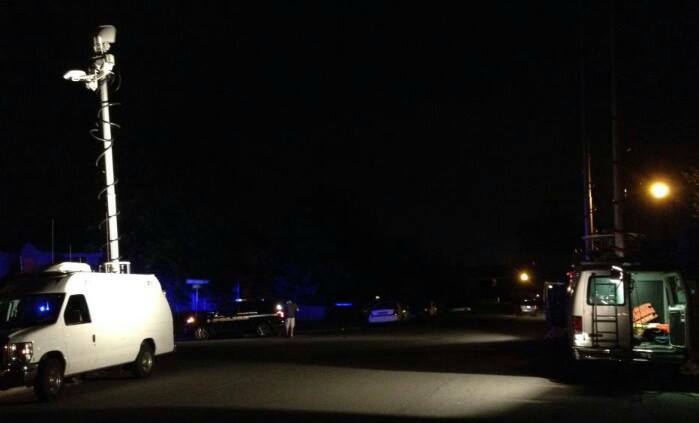 HERNDON, Va. (WUSA9) -- Police are currently serving a search warrant at the home of Adam Kokesh, an outspoken gun rights activist. WUSA9 interviewed him yesterday about why he brought what appeared to be a loaded rifle into Freedom Plaza on the Fourth of July and posted video of it on YouTube. At this hour, US Park police confirm the search warrant has been issued, police surrounded the block, but Kokesh was nowhere to be seen. Instead of the outspoken libertarian, WUSA9 spoke to his producer tonight who believes he will most likely get arrested tonight. "Probably he's gonna get arrested ...this is just the beginning." Gun rights activist Adam Kokesh, appeared in a YouTube video, breaking DC's strict gun law by loading a shotgun blocks from the White House July 4th morning. Tonight, a swarm of police cars surrounded the home where the 31-year-old Iraq war veteran turned anti-government activist is in. His producer Darrell Young says, "Could be in the house could already be taken out I don't' know they didn't give me access to the house yet." Young says he's he's not worried. He says, "Adam's a strong guy, when you take out one person out this revolution you'll have 2...3 more step up." Kokesh has not been arrested as yet. However, carrying a gun outside in D.C. is a felony that brings with it up to five years in prison and a fine of up to $5,000. A search warrant was being executed Tuesday by U.S. Park Police at Kokesh's home in Herndon, Va. Police officers were reportedly searching for the shotgun Kokesh displayed last week, according to Kokesh's producer and roommate Darrell Young. "We were expecting this," Young said. "We were expecting the Government to raid our house." Kokesh, an Iraq war veteran, told News4 Monday that his actions were intentional. It doesn't make sense that he can have a gun on one side of the river and not the other, he said. "I was ready to stand by my word, and I was ready to commit the civil disobedience that I had committed to," he said. [...]Kokesh said he believes he is the legal owner of the gun shown in the video, but declined to say where -- or if -- it was registered. "I was here, and I loaded a shotgun on Independence Day, but I didn't kill anybody. I didn't drone any children," he said Monday. "I didn't steal any children's future. I didn't sell this country into debt. I didn't do any of the crimes that the man two blocks over at the White House is responsible for."